Elephant Research - What makes elephants nervous? Volunteers at our Elephant Care and Research project in South Africa are assisting in carrying out research to understand more about elephants’ behaviour and identify precursors to elephants becoming worried, and how they react when they are nervous. The results of this research can be used to improve the welfare of elephants in captivity. We know that humans bite their nails and touch their face and hair, and that primates can display yawning, ground-slapping, circular nose-wiping, scratching and self-grooming behaviours when they’re nervous, but very little research has been carried out on elephants in this field. Many ‘displacement’ behaviours have been observed in elephants such as trunk twisting, foot-swinging, touching parts of their face and mouth with their trunks and pretending to feed, but these have not been fully understood. These behaviours can be consider akin to a human rapidly tapping a pen on a desk whilst trying to write an essay and can suggest levels of nervous energy. These self-directed behaviours can sometimes be observed when one elephant is in the proximity of another more dominant elephant. For example when there is supplementary food around, the less dominant elephant is motivated to eat the food, but also wary that there is a more dominant elephant present who may react aggressively. These conflicting motivations (wanting the food but wanting to stay away from the dominant elephant), can sometimes result in self-directed behaviours such as touching their own ear. These behaviours have been observed whilst staff and volunteers have been researching two bull elephants at the project (Harry and Namib). While this is very interesting research of elephants’ behaviour in a social context, and is applicable to both wild, captive and semi-captive elephants, the project is particularly interested in what other triggers there are that could make an elephant ‘nervous’ so that the research findings can be applied to animal welfare. There are many conditions that are outside of the elephants’ control in a captive or semi-captive environment which could trigger such behaviours, and insight into the elephants’ emotional response to these are very valuable. Displacement behaviours may not automatically suggest the elephant is worried, as in some contexts this is completely normal. These behaviours should not be confused with stereotypical behaviours such as swaying or pacing which are generally agreed to be a manifestation of long term stress. However volunteers and the rest of the research team have been noting the context of displacement behaviours and communicating with the elephant handlers about this. They can then analyse the environment to identify any possible triggers that may be making the elephants ‘nervous’. Understanding stress in animals is essential to their correct management. The project aims to prove that these behaviours can be used to identify and quantify stress in a non-invasive and scientific manner, which is quicker and less expensive that methods such as testing dung for ‘stress’ hormones. The project’s goal is to create a worldwide recognised ‘welfare index’ for elephants which will enable stressors to be recognised and dealt with before it becomes a welfare concern. However the behaviour measure must first be validated to be considered a reliable indicator of welfare. Studies of primates are more advanced in this area and studies have shown that displacement behaviours and levels of stress hormones in dung correlated, meaning that displacement behaviours are a reliable indicator of anxiety in primates. 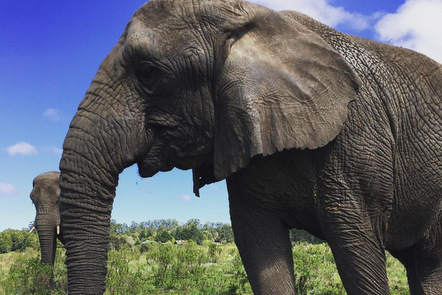 The research team at the project has been carrying out similar validation tests on elephants at the park and across other parks in South Africa by collecting extensive behavioural data as well as dung and saliva samples. The findings of this study will enable managers to have a better understanding of the consequences of their husbandry procedures, veterinary procedures and any tourist encounters and can use these subtle behaviours to gauge their elephants’ welfare. If you would like to join the research team and volunteer at the Elephant Care and Research project, click here for more information.